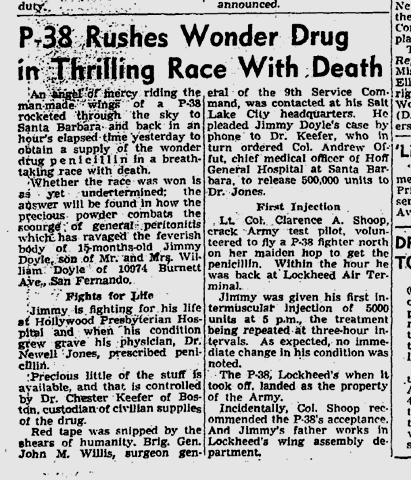 Feb. 11, 1944: A P-38 rushes from Los Angeles to Santa Barbara and back in an hour to get penicillin for a Jimmy Doyle, 15 months old, who has peritonitis. “Precious little of the stuff is available and that is controlled by Dr. Chester Keefer of Boston, custodian of civilian supplies of the drug,” The Times says. The P-38 was flown by test pilot Lt. Col. Clarence A. Shoop, who turned the plane over to the Army when he was finished after picking it up from Lockheed, where Jimmy’s father is an employee. Actor Charlie Chaplin is indicted under the Mann Act and is also accused of criminal conspiracy along with six others. A second charge accused of him of bringing her back to Los Angeles for the same purpose. The rest of the charges against Chaplin’s co-defendants involved an alleged plot to run Berry out of town on a charge of vagrancy that would be dropped if she left the state. Accused in the conspiracy were Beverly Hills Police Judge Charles Griffin, Beverly Hills Police Capt. W.W. White, Beverly Hills Police Lt. Claude Marple, Beverly Hills Police matron Jessie Billie Reno, radio commentator Robert Arden and movie producer Thomas Wells “Tim” Durant. Observing the fighting between U.S. and Nazi troops in Cassino, Tom Treanor writes: “We see houses disappear in smoke and dust, fragments spinning slowly into the air. Then when the smoke clears, the house looks almost as it did before except for another hole in one corner, usually high up. “Jane Eyre,” starring Orson Welles and Joan Fontaine, “is precedent-shattering and even bizarre,” Edwin Schallert writes. Opening today: “The Iron Major” with “Escape to Danger” (Ann Dvorak alert!) at the Fox Ritz, Los Angeles Theatre and the Egyptian. This entry was posted in 1944, Art & Artists, Aviation, Columnists, Comics, Crime and Courts, Film, Hollywood, Medicine, New York, Tom Treanor, World War II and tagged 1944, art and artists, aviation, columnists, comics, crime and courts, Tom Treanor, World War II. Bookmark the permalink. 2 Responses to Chaplin Indicted on Mann Act! I understand Chaplin was acquitted. The Mann Act intended to stop so-called “white slavery”, defined as gangsters transporting young women across state lines in order to pimp them out in the big cities. Drugs are often involved. This was and is a real problem. But any man who has taken his girlfriend to Las Vegas or Hawaii has technically violated the Mann Act. So, who hasn’t? Wouldn’t be surprised if old J. Edgar used the Mann Act as part of his generations-long hatred for Mr. Chaplin and all he stood for. Such devious actions of governmental harassment were at Hoover’s evil little core.